It’s just what you always wanted: a big-screen TV, the latest laptop, an e-reader, a digital SLR camera, or that video game system. The presents are all unwrapped, and the recycling is piling up. But while you’re enjoying that new tablet, the box is sitting out by your curb, acting as an advertisement for those who might be looking to rob your house. Year after year, electronics are one of the most-gifted items during the holidays, and also the most commonly stolen from homes, according to Safewise. 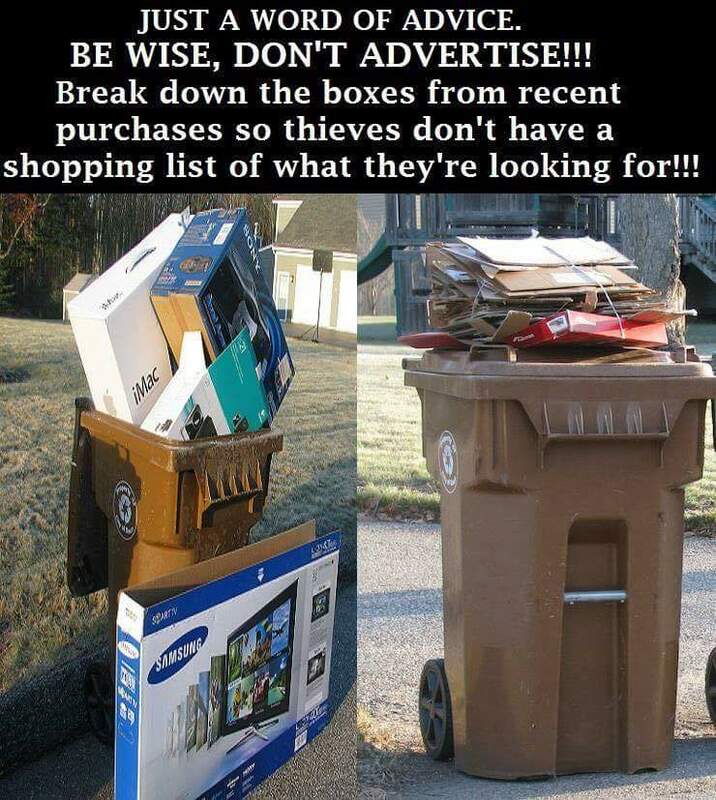 Don’t let your efforts to recycle cardboard, boxes, and packaging from your new gadgets attract thieves. Keep what was under your tree out of sight with these tips from CBS 46 and NBC 12. Save the serial number: Electronics can be difficult to track if stolen, especially without means for identification. Make sure to record the serial number on the box or the item, and keep it in a safe location. You can also take a photo of the device’s make, model, and serial number to make identifying it easier. Keep it inside: Instead of stashing flattened boxes by the street, keep them closer to home until recycling day. Store cardboard in bins in your garage, or another place that’s not in plain view of the street. Cut it up: Just like with banking documents, it’s a good idea to cut up shipping documents and boxes to prevent robbers from stealing your identity or finding out which laptop model you received. Recycling old electronics? Wipe them clean. Check out the FTC’s tips for removing all personal information from cell phones, computers, or other electronics before disposal. Removing the SIM card from your cell phone or the hard drive from your computer allows you to keep or destroy the memory. For more information on identity theft prevention, check out BBB’s Everyday Habits to Safeguard Your Security.